Ready to escape to the Florida Keys? 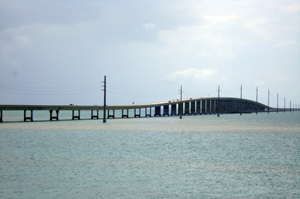 The Florida Keys island chain is linked to mainland Florida by U.S. 1, also known as the Overseas Highway. Getting to this tropical paradise is easy as you can actually drive, fly or take a short ferry ride to the Keys from mainland Florida. Visitors can fly into Miami International Airport or Ft. Lauderdale-Hollywood International Airport to get to the Keys. Once you arrive at either airport, just hop on a shuttle bus or rent a car. You will arrive in the Upper Keys in about an hour from Miami or an hour and 45 minutes from Ft. Lauderdale. If you're planning on going to Key West, the trip will take about 3.5 hours over U.S. 1. In addition, you can now fly to Marathon, located at the mid-point of the island chain, aboard small airlines such as Florida Coastal Airlines and SeaCoast Airlines. Shuttle buses and rental cars are available for your convenience. Want to go straight to Key West? Then choose to fly to Key West International Airport via connections or direct flights. There is a variety of ground transportation selections, including local shuttle buses and rental cars. The Key West Express ferry service takes passengers from Ft. Myers Beach and Marco Island located on Florida's southwest coast to the Florida Keys. Passengers arrive at the Key West Bight Ferry Terminal in approximately 3.5 hours. The gateway to the island's Historic Seaport District, the terminal offers an information desk, gift shop and a café. 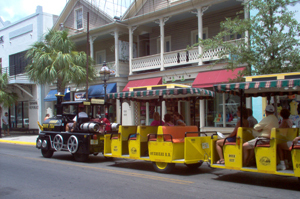 Stroll along a Harbor Walk lined with charter boats, restaurants and shops and arrive on the famous Duval Street in 15 minutes. Rental cars are also available for those who wish to explore other areas of the Keys. 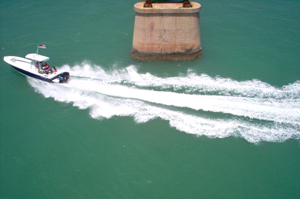 Experienced boaters can navigate to the Florida Keys along the Atlantic side of the Keys or by traveling on the Gulf of Mexico side. The Intracoastal Waterway from Miami passes through Card and Barnes Sounds into Florida Bay – keep in mind this course is limited to 5-foot draft vessels. The oceanside route is Hawk Channel, a buoy marked passage between the outer-most reefs and the Keys. Numerous marinas are available, but make reservations ahead of your arrival. Also, cruise ships sail regularly to Key West. ways to get around by land. Take the scenic route and drive to the Keys! From Miami International Airport: Take LeJeune Road south to 836 West. Catch the Florida Turnpike south toward Key West, the Turnpike ends at US 1 in Florida City. Now follow U.S. 1 south about 22 miles to Key Largo. You are in the Florida Keys. From Ft. Lauderdale-Hollywood International Airport: Follow the signs for 595 West. Take 595 to the Florida Turnpike. The Turnpike ends at U.S. 1 in Florida City. Now follow U.S. 1 south into the Florida Keys. From the north, take the Florida Turnpike south to just below Ft. Lauderdale, where Exit 4 (Homestead/Key West) joins the southern portion of the Turnpike, the Turnpike ends at US 1 in Florida City. Follow U.S. 1 south into the Florida Keys. From Florida's West Coast: Take 1-75 Alligator Alley east to the Miami exit, then south to the Turnpike Extension. The Turnpike ends at U.S. 1 in Florida City. Now follow U.S. 1 south into the Florida Keys. Now that you've arrived in the Florida Keys, by whatever mode of transportation, have fun exploring this tropical paradise. There are a plenty of ways to get around the islands - by land, sea or air!